Thanks to widespread interest in heart-healthy cuisine, international flavors and the increasing affordability of extra virgin olive oils, many of us are using specialty oils in ways our mothers would have never dreamt. But there are many more oils to enjoy than olive oil, observes Charles Hechinger, executive chef at the Claremont Resort & Spa in Berkeley, CA. Delicious and affordable oils include Trader Joe’s Extra Virgin Olive Oil and Whole Foods’ house brand 365. For autumn and winter, Chef Hechinger suggests using organic pumpkin oil in butternut squash pastas, pumpkin soups, salad dressings, and roasted vegetable dishes. One of the best, nationally available manufacturers of healthy oils is Spectrum Organics. This company’s mission is to make healthy oils and healthy fats available to the public. Whether artisan olive oils and trans-fat free spreads, or super-healthy, anti-inflammatory supplements like Flax Oil, Spectrum organic oils are all delicious and worth experimenting with in your salads, soups and main courses. Their Web site offers extensive guidelines on various oils and how-tos on using them in salads and cooked meals. On the Spectrum site, you will also find hundreds of low-fat, gourmet recipes for snacks, main dishes and even three course meals. Regarding diet oils for those who are calorie-conscious, the new cooking oil Enova TM may be worth trying. Full disclosure: Enova is a synthesized oil cooked up in the laboratory from soy and canola oils, meaning Enova is not found in nature. Its merits as a weight loss tool, however, may offset its synthetic aspects. 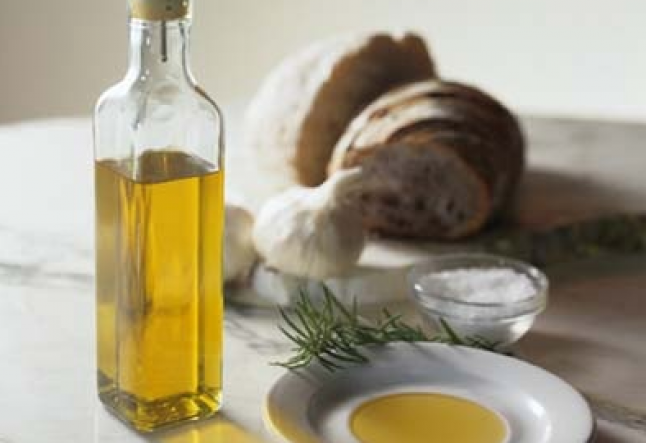 “When used as part of a calorie-controlled diet, it has been clinically shown that compared to other cooking and salad oils, less of Enova is stored in the body as fat,” says Kevin Maki, Ph.D., a researcher who has studied the oil. Enova is available nationally in supermarkets.. In conclusion, when experimenting with culinary oils, it is always wise to remember that less is more. Start out using tiny amounts if you are not sure about how intense the flavors may taste. For example, a dash of white truffle oil stirred in before serving imbues pasta and risottos with a bona fide, earthy, European flavor, while EFA-rich Moroccan argan oil has been used for millennia to add savory, North African intensity to lentil and salad dishes.